The Jordan Valley—which borders Israel, the Palestinian Authority and Jordan—has been transformed into densely settled farmland. BirdLife Partners are working together in these countries on a community-based project, which is a landscape-level, long-term approach to nature conservation and peaceful coexistence between the peoples of this war-torn region. One hundred years ago the Jordan Valley was a sparsely populated and wildlife-rich landscape of steppes, savannas, floodplain wetlands and scattered oases. 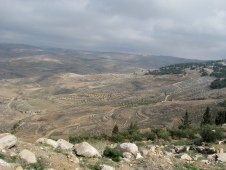 Today, irrigation and energy networks have transformed these rangelands at the borders of Israel, the Palestinian Authority and Jordan into densely settled farmland. Intensive land uses now threaten the ecological integrity of the valley, through urban and industrial sprawl, depletion of surface water and aquifers, salinisation of soils and waters, and pollution by farm chemicals, factory and sewage wastes. Poverty and inequality affect many of the agricultural communities in the valley. BirdLife Partners in these countries are working together on a community-based project, the vision of which is to transform the Jordan Valley into a more ecologically sustainable region, through a combination of nature-based socioeconomic development and better land-use planning, site protection and management. to promote dialogue, conflict resolution and co-operation between different interest groups such as developers, farmers and environmentalists. In the longer term, a network of nine such centres is planned (three per country). By taking a transboundary approach to nature conservation, BirdLife Partners are encouraging coordinated environmental action between countries and building new economic infrastructures for the region. The project is thus a landscape-level, long-term approach to nature conservation and peaceful coexistence between the peoples of this war-torn region. Lambertini (2003) Ali Notizie 38: 2–3.